Due to the word limit on LJ, the Master List is split into three parts. This is Part 3 of the Master List. Part 1 can be found here and Part 2 can be found here. Due to the word limit on LJ, the Master List is split into three parts. This is Part 2 of the Master List. Part 1 can be found here and Part 3 can be found here. While there is a Master List on the LJ already, I wanted to do my own version and include some new materials that I think will benefit the Ai no Kusabi fandom. I was able to find a lot more official Ai no Kusabi content a few years back and want to share it with the fandom. I know how many fans have been desperately trying to find them for years. However, because the series is old, the fandom is small and scattered all over the world, and content is only available in Japan, there will be some materials that will not have any links or sources to them. If any fans know where to find some of the missing content on the list or wish to include additional info, please contact me so I can update it. Due to the word limit on LJ, the Master List is split into three parts. Part 2 can be found here and Part 3 can be found here. Hiya, folks! :D While this is a little belated, I wanted to tell the community some news. 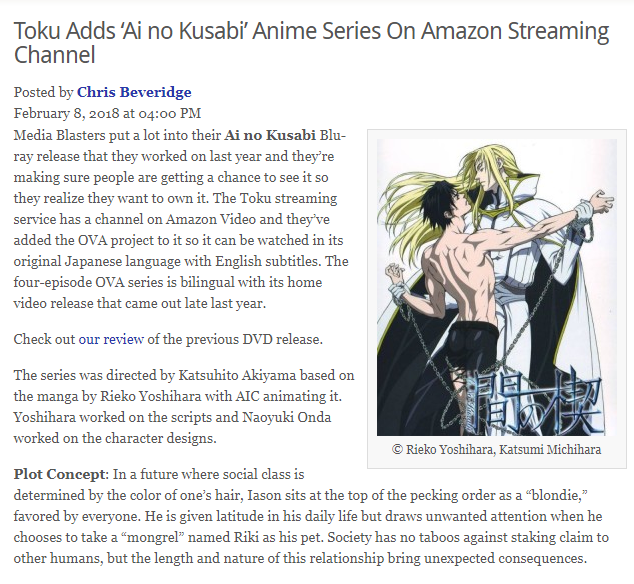 According to an article on the website "The Fandom Post", the Toku television and streaming service has a channel on Amazon Video and they've added Ai no Kusabi to it. :) The four-part OVA can be watched in its original Japanese audio with English subtitles. Just wanted to pass along the news to the fans. Honestly, though... I wouldn't really recommend watching the episodes if the service is using Media Blasters' horribly translated subtitles. ^_^; Still, I guess it's kinda good that the series is getting some recognition from a streaming service. Hi, everyone! I hope all of you are getting a good start in the new year. 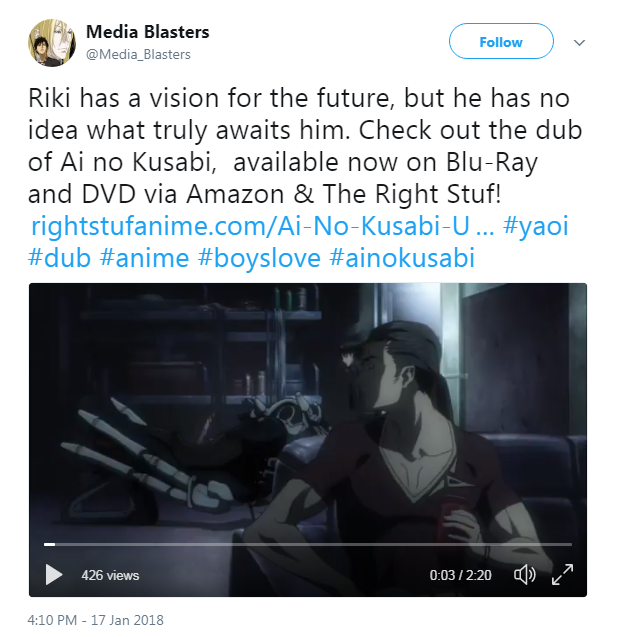 :) Today, Media Blasters uploaded a new English dub clip for Ai no Kusabi on their Twitter in order to help promote the release. Happy New Year, everyone. 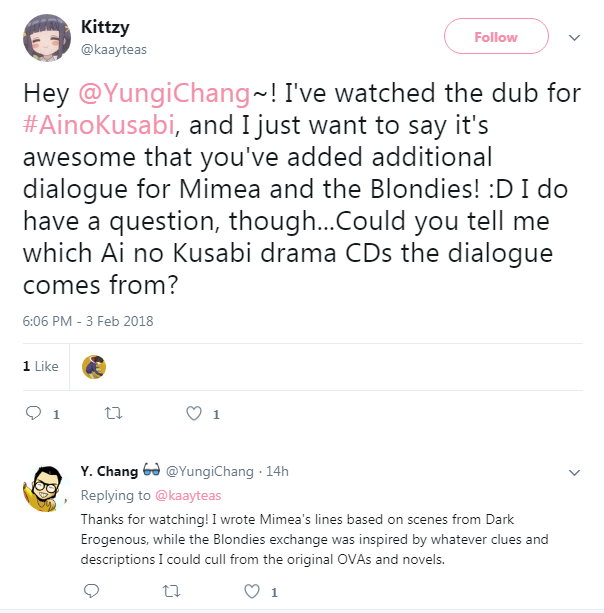 :) Although this isn't very important to the franchise as a whole, Ms. Brittany Lauda posted a few tweets talking about Ai no Kusabi and what working on the English dub has taught her as a director. She sounds very happy with the way the English dub turned out, as she worked really hard on it due to a tight deadline. I thought I would share them with the community. Unfortunately, it's not all of the bloopers. 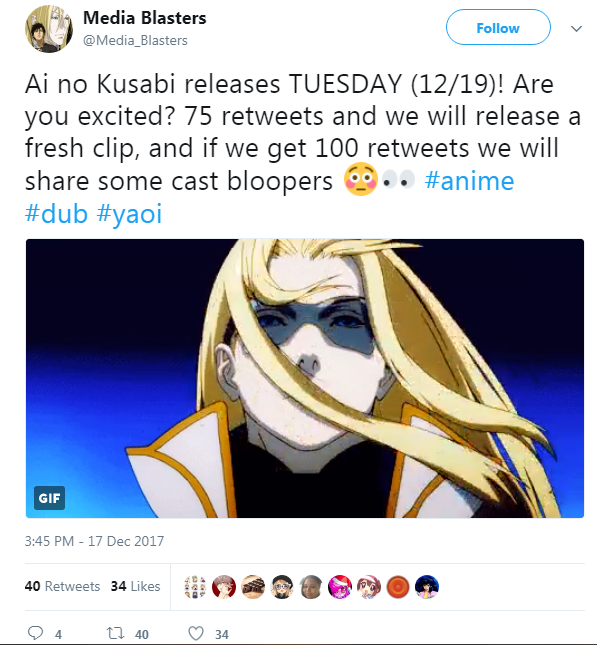 Ms. Lauda revealed in a tweet that she exported almost a hundred bloopers for Ai no Kusabi, though Media Blasters claim that fans might be able to get more if Ms. Lauda host one of their panels in the future. The bloopers won't be included on the DVD/Blu-ray since there wasn't enough room to put them on the discs, according to Ms. Lauda. On a side note, I'm pretty disappointed that Media Blasters never addressed fans' concerns regarding the subtitles, given the fact how horrible the subtitles were on the DVD release. One fan asked Media Blasters twice about fixing the subtitles, and they never answered her.